Are you having a hard time figuring out what kinds of inserts to use in your pocket cloth diapers or in your covers? Calgary Cloth Diaper Depot & I want to help you figure it out! The wonderful Miranda sent me three VERY different inserts to try out and share my thoughts! The Hemp Babies insert was the "smallest" in size of all three inserts, but I if I had to pick, I really loved this one best! It was super trim, the easiest to fold (even according to DH), and held its own when it came to my heavy wetter! It did not fit the best into the wide AppleCheeks diaper bifolded, but it was a perfect fit in both my Fuzzibunz and my Sunbaby. I do have a soft spot for hemp inserts - they just seem to work better for my little one. The AppleCheeks insert was a very close second place to the Hemp Babies in my mind. It took some getting used to, I wasn't a fan at first. But it was also very trim, and more versatile because it could be bifolded or trifolded, and it certainly did a great job at holding in the liquid most importantly! It acutally seemed to fit pretty well in all three diapers. The FLIP insert was my least favourite, but not because it didn't work amazingly! This thing can hold a ton of pee! If you are using pockets at night, especially something big like an AppleCheeks size 2 or with a toddler, try this one out for sure! I have only 1 lonely AC in my stash, the majority of my pockerts are tiny Fuzzibunz and this baby was just too huge for most of my pockets (this is by far the largest and bulkiest of the three inserts). 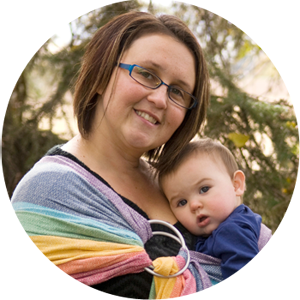 Calgary Cloth Diaper Depot is a family run business located in Calgary, Alberta Canada owned by the amazing Miranda. Besides running her business Miranda stays at home with her 4 kids and have been cloth diapering for almost 6 consecutive years. They recently added their latest diaper model to their family, a baby girl. Besides her love of Cloth Diaper Miranda also is passionate about gardening, crafting with her kids and weekend trips to the mountains with her family. 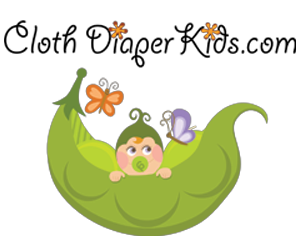 Calgary Cloth Diaper Depot grew shortly after the birth of their first baby when Miranda saw a need for one place to buy name brand diapers online at prices families can afford. They carry only the brands they have fallen in love with for their family. Fast forward 4 years and Calgary Cloth Diaper Depot not only strives to have the best customer service in the industry but they also give back to the community by donating proceeds from their sales to families in need. Their website caters to new parents with a great Test Drive Program where you can try before you buy, multipack discounts on top brands and generates excitement with Giveaways and Flash Sales on their Facebook Page. Take advantage of their Free SHIPPING on all AppleCheeks products made here in Canada! 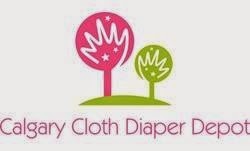 You can also celebrate with Calgary Cloth Diaper Depot this Holiday Week June 30th-July 6th when they showcase their favorite brands at fantastic prices! Make sure you also enter to win Bumgenius Jules on their Facebook Page and receive 10 bonus entries with purchase. To check out the sale Click Here! I hope all you amazing followers will make sure to check them out on Facebook and help them reach the huge 10,000 Facebook fans Milestone! HUGE thanks to some awesome bloggers for jumping and joining the fun too! Be sure to check out MyItsy, Crunchy Livin' Mama Style, All Natural Mom 101, mama pure, and Life of a Southern Mom. This giveaway is open to residents of the U.S. and Canada. Winner will be chosen using Rafflecopter, and notified by email and/or facebook. Winner has 48 hours to respond before the prize is forfeited and a new winner is chosen. Prize is shipped from chosen Supplier, Bloggers are not responsible for prize fulfilment. This giveaway is not sponsored, endorsed or administered by, nor associated with Facebook. By entering, you release Facebook from any responsibility and understand that the information entered on this form will not be disclosed to Facebook. 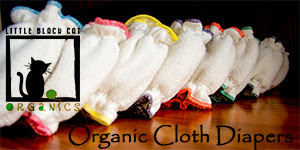 Flip Organics are my favorite because of the organic material, how well they fold and they absorb a lot! I love my Hemp Babies doublers, that's all I own besides the inserts and doublers that come with my WAHM diapers. 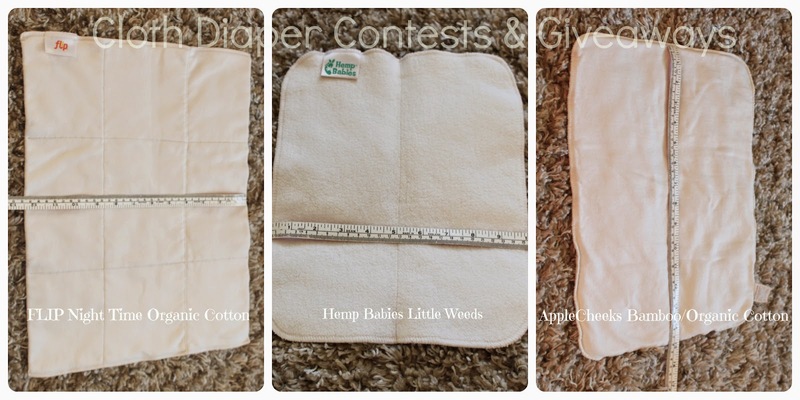 I'm new to cloth diapering so have only tried Thirsties hemp/cotton inserts. I like them, but would like to try others. It seems like a bit of an unfair review trying to cram inserts into diapers they weren't meant for. Try a Flip insert inside of a Flip cover or even a Happy Heiny pocket diaper and you'll be singing a different tune. At least you got one thing right - Flip definitely wins on absorbancy. They are the only insert that can get my older bedwetters (4+) through the night with no leaks. I'd like to see a Hemp Babies do that. I use Grovia soakers and if needed the booster as well. I like pad folded flats with a hemp booster. They are absorbent and wash well in our HE FL washer. I love Thirsties hemp inserts because they are so absorbent, but I have grown to love pad folded flats because they wash well and dry fast on the line. AMP hemp 2-layer inserts or 3 layer boosters. Also love AMP bamboo trifolds. Bamboo for sure! Although I am currently in a flour sack towel phase, I was surprised at how well they worked! I mostly use mf. and double that with a bamboo. seams as our perfect combo. Im new to the cloth diapering but my friend swears by flip and i will be buying hers once her tot is fully potty trained. We are still trying to find the perfect insert for our pockets, which we only use overnight (prefolds during the day). Right now we're using the MF inserts that come with our FuzziBunz with a VERY worn prefold (hand-me-down) trifold. It works well enough for now with my 10 week old but I know we're going to have to find a trimmer, more absorbent option soon because she is a heavy wetter already! I've started loving just using flats because they are so easy to wash and don't really retain smell (so you don't have washing issues)... plus, they can take a beating in the wash. No delicate handling them! I like using receiving blankets in covers and bamboo in pocket diapers. Geffen Baby cotton-hemp fleece inserts! I love my Button's inserts, but I haven't had much experience with any others. i love buttons inserts love the shape there really thick and i never have leaks! The thirsties hemp insert paired with a pad folded flat. Oops because the flat absorbs fast and the hemp holds a lot of pee.